It can take millions of pounds and many years to achieve the kind of fame that sharp suited, oblong red spectacled marketing types talk of over a long lunch in the City. It's not simply brand awareness they want, the absolute pinnacle of a brand is when the very name becomes part of everyday language. That's when we Hoover the carpet rather than vacuum it, SkyPlus a tv show rather than record it and something controversial is a Marmite situation. You can almost hear the Madmen toasting themselves with a Bolly oh hang on that's another one. Occasionally new words added to the language are not quite as positive. 'Rachmanism', perhaps lesser known these days was a shorthand word for a slum landlord, an exploiter of tenants and an all-round property rogue. Rachman himself was an immigrant to the UK who in the 1950's and 60's owned over 100 Mansion Blocks (or slums as they would now be known) and became infamous for methods to evict tenants, even becoming caught up in political scandals of the time. 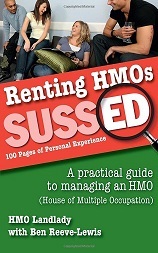 The word sprang to my mind when I was asked to read and review Renting HMO's Sussed: 100 Pages Of Personal Experience, a recently published title available on Amazon. There is an undeniable truth about the world of HMO's or Flatlet Houses, that makes them the most challenging of properties to own or live in. They are usually owned by wealthy and successful individuals who often were able to make large sums of capital in other ways before entering the bedsit world. On the other hand, the tenants are often some of the most vulnerable and poorest people in society and increasingly are new arrivals in the Country unaware of the protective legal framework we enjoy. It is therefore unsurprising that when these two worlds collide there are often issues. Repairs, evictions, theft, threats and excuses. It is these problems and ways to avoid them that the mysterious HMO Landlady delivers so effectively in this title. But it is the degree of humour and indeed compassion for tenants that separates this book from the myriad of get rich quick, tread on everyone property manuals currently on the market. She shows that it is possible to treat tenants fairly and still make an honest and comfortable living out of HMO's. I'm not sure why a pen name was needed as she patently has nothing to hide, but it's a minor gripe, the book covers everything from buying to decor and a lot of legal tips in between. The Top Ten Things That Will Happen To You When You Own An HMO made me chuckle and will do the same to anybody who has owned or managed a property like this or indeed lived in one. I suspect a few readers will also raise a knowing and slightly embarrassed smile remembering their days in student digs, especially regarding item 3 on page 88. This book may help to deter those thinking of buying an HMO halfheartedly and will be of great help to those that do buy. A great place to start what will most certainly be a very interesting addition to a buy to let portfolio and will provide you with anecdotes for years to come, whether you want them or not. The book is now available on Amazon.co.uk and HMOlandlady.